The Heller Case: Gun Rights Affirmed! The case that saved the Second Amendment! to the biggest gun-rights case in history. The FIRST book ever released on this groundbreaking case! The lawsuit that saved the Second Amendment! Get two copies for only $30, save $19.90! Keep one and give one away! Alan Gura, Bob Levy, Don Kates, Glenn Reynolds, Eugene Volokh, David Hardy, Clayton Cramer, Robert Cottrol, Bruce Eimer, Joyce Lee Malcolm, Michael Anthony, Sandy Froman and many more! 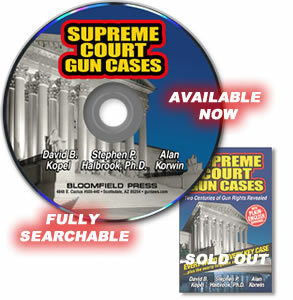 • Special bonus: Descriptions of all 96 Supreme Court gun-related cases 1820 to 2008! This is the enduring reference guide to the most important gun-rights case ever heard at the U.S. Supreme Court. The Heller Case: Gun Rights Affirmed! is the very first book on the subject, released just two months after the decision was announced. It captures all the original history that will control the gun-rights debate for decades to come. Add this powerful tool to your library. Read and enjoy a dozen different sections about the case—from eyewitness reports in the courtroom— to the earliest legal briefs, lawsuits and gun-rights theories following the landmark decision. Anti-rights activists are already planning “creative interpretations” to continue their disarm-America campaign. That’s in here too! Fight back, know the facts, see what you can do to preserve the right to keep and bear arms! Have this “first edition of history” in your hands for now and the future! 448 pages of dynamite, $19.95 +S&H -- You save $5 off the $24.95 list price! You can call, fax, mail or easiest—order online. Encourage politicians to pass more laws... with expiration dates. Why did the news media hate the Heller decision so much? Like many politicians and anti-rights activists, reporters conflate gun ownership and criminal activity. To them, guns and crime are synonymous. They believe guns exclude any intent but evil intent. They can’t seem to separate in their minds the difference between tens of millions of decent Americans who own, use and enjoy firearms, from criminals doing bad things in bad parts of town. In fact, “enjoy firearms” is an alien, illogical, impossible concept to such people. They are totally closed to the idea of “the good that guns do,” even though they see armed police all day long. NYC Mayor Koch said it perfectly years ago—Why would an honest person even want a gun? “You’re not a nice guy if you have a gun... even if you are a nice guy." He had to overlook his own bodyguards and thousands of police to reach such a preposterous conclusion. You can’t really blame such folks. They are self-insulated from the vast portion of America that trusts and uses firearms on a daily basis. They have no connection to the industry, sport, gun owners or a freedom mindset that recognizes the enormous social utility of firearms. And their circles of friends are just like them, it’s a self-reinforcing closed loop. Plus, they read their own writings, and it all says the same thing. They see “guns are bad” all day long, and never stumble upon “guns are good.” Guns save lives. Guns stop crime. Guns are for safety. And they just don’t get that guns are why America is still free. You almost have to feel sorry for people whose entire lives are so sheltered that this most fundamental of American values elude them, while they run around thinking they get the big picture. So Heller was a total shock to the entire crowd. This removal-from-reality effect is what led the Mayor of San Francisco to say this ruling, “just flies in the face of reality.” Or for Tom Barwin, the Village Manager of Oak Park, Ill., where gun rights were totally denied to the public, to say, “It’s just completely befuddling that our Supreme Court would be in alliance with the gangbangers.” They just don’t get it. Their false perception that only criminals have guns is reinforced daily by the “news” without a single breath of clean air. They are uneducated and kept in ignorance. They deserve pity, sympathy, and a trip to the range with anyone who will take them. If they suffer from hoplophobia, the irrational morbid fear of firearms, they should seek treatment. The other crucial point missing in their thought process may be that crime, and especially gun-related crime, is a function of the bad part of town. That’s an ugly concept, and too many people are in denial about this. Criminal gunfire isn’t a random act—it has demographic, geographic, social and economic boundaries. The police have dot maps of where the bodies fall. You know where those parts of town are, and you know not to go there. Take a look for yourself. Baltimore. To really end the “gun problem” we must look at the demographics of it, and its connection to the war problem—the war on some drugs. We must stop calling war deaths by any other name. We can beat this thing—when we realize that Heller made sense, and a chunk of society—the chunk that desperately, frantically, irrationally wants guns to “just go away”—is in the dark and looking the wrong way. Alan Korwin is the co-author of The Heller Case: Gun Rights Affirmed, the first book to come out about the D.C. gun-ban case, and he can be reached at gunlaws.com.